Partech Lighting Systems originated from the live production entertainment industry and we are very familiar with the high expectation aspects of our industry. We know well the demands and challenges of providing production services with the harsh environments that today's Hi-Tech equipment must perform in and we excel in overcoming these challenges. We are well equipped to handle the many obstacles that the industry encounters such as logistics, limited setup and strike schedules and tight budgets. Whether it is a one night event, weekly business seminar or long term tour we have the knowledgeable and expertise from design through execution to exceed your expectations and to guarantee consistency. We specialize in an array services for illuminating buildings and landmarks with a wide variety of color and graphic effects. We can also implement all weather systems either for one night functions or temporary installations for monthly holiday events. We can project custom logos and graphics for use as advertising or to draw attention to a particular area and to help establish an events' theme or function. Regardless if it's a day, week, month or year. Partech Lighting Systems can package and maintain a lighting system for this harsh environment of the entertainment industry. We have a long history in this area of production services starting from our very beginning. We have toured with a long list of popular and well known artists and clients. We maintain our inventory of equipment for the rigorous duty and limited production schedules of these types of events. Our staffs are well seasoned and have gain valuable real-world experience from the many years working in this market. Whether a Fortune 500 company or a local enterprise, Partech Lighting Systems can construct a lighting system that will satisfy all the requirements needed for this type of demanding application. 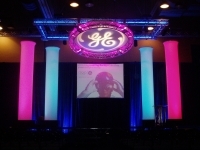 From the appropriate lighting levels required for video reproduction, expectations to achieve the "WOW" factor and the difficult logistics involved with the type of some venues these functions transpire in, we have the equipment inventory and technical knowledge to make these events happen flawlessly. Another cutting edge piece of technology that we are also proud to add to our inventory. The Panorama Media Server is a powerful PC Based stand along Media Server. Rose Brand has combined ArKaos 3.6 DMX Media Server Software and Specially Optimized Hardware to create the Next Generation of Scenic Technology. Panorama provides a powerful and affordable media server solution capable of driving projectors, plasma displays, SoftLED Draperies, or any other video based equipment. We are proud to be able to offer a Revolutionary Technology to our customers the High End Systems DL-2 Digital Automated Lighting Fixture. High End Systems has become the industry's leading manufacturer through its pursuit of high performance and quality. 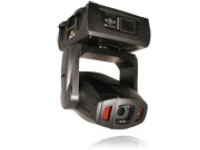 The DL-2 Takes digital lighting to the next level, featuring an integrated digital media server. Please read more about this amazing product and all the possibilities that it allows for creative freedom and how it can be used with your next production. If you would like a demonstration on either of these products please feel free to contact us at your convenience to set up an appointment.